Here is the list of all new keyboard shortcuts keys you need to know in Windows 10. Windows 10 offers a bunch of improved support for Snap. Try these keys and see what happens! Windows Key + Right – Snap current window the right side of the screen. 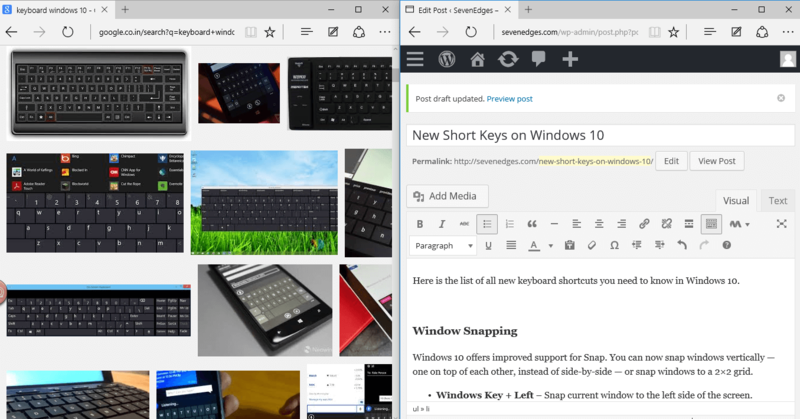 Windows Key + Tab – This opens the new Task View interface, and it stays open — you can release the keys. Only windows from your current virtual desktop will appear in the Task View list. You need to enable it to use these short keys. Open Command Prompt’s properties window to do that. Ctrl + V or Shift + Insert – Pastes text at the cursor. Ctrl + C or Ctrl + Insert – Copies the selected text to the clipboard. Ctrl + A – Select all text in the current line if the line contains text. If it’s an empty line, select all text in the Command Prompt. Selecting Text / Shift Key Shortcuts: Many of the standard Shift key shortcuts are going to work in command prompt now. Really nice..isn’t it? Shift + Left / Right / Up / Down – Moves the cursor left a character, right a character, up a line, or down a line, selecting the text along the way. Continue pressing arrow keys to select more text. Ctrl + Shift + Left / Right – Moves the cursor one word to the left or right, selecting that word along the way. Shift + Home / End – Moves the cursor to the beginning or end of the current line, selecting text along the way. Shift + Page Up / Page Down – Moves the cursor up or down a screen, selecting text. Ctrl + Shift + Home / End – Moves the cursor to the beginning or end of the “screen buffer,” selecting all text between the cursor and the beginning or end of the Command Prompt’s output. There are few more..try out these too..
Ctrl + Up / Down – Moves one line up or down in the Command Prompt’s history — it’s like using the scroll bar. Ctrl + Page Up / Page Down – Moves one page up or down in the Command Prompt’s history — it’s like scrolling even farther. Ctrl + M – Enter Mark Mode, which helps for selecting text. Previously, the only way to do this was by right-clicking in the Command Prompt and selecting Mark. Thanks to the new Shift key shortcuts, this mode is no longer as important. Ctrl + F – Opens a Find dialog for searching the Command Prompt’s output. Alt + F4 – Closes the Command Prompt window. Above are few useful shortcut keys introduced in Windows 10. I hope this will help you while working on Windows 10. Have a great Windows 10 experience.